Risottos are my favourite comfort food. They have a fantastic ability to carry an almost endless list of ingredients. Invariably, when it comes to risotto, simpicity is best; too many flavours can jar the palate and mask the essense of what a risotto really is. You can’t make a good risotto without having a great liquid to cook the rice in. Here, instead of stock, beetroot juice and water are used to create a striking colour and taste. 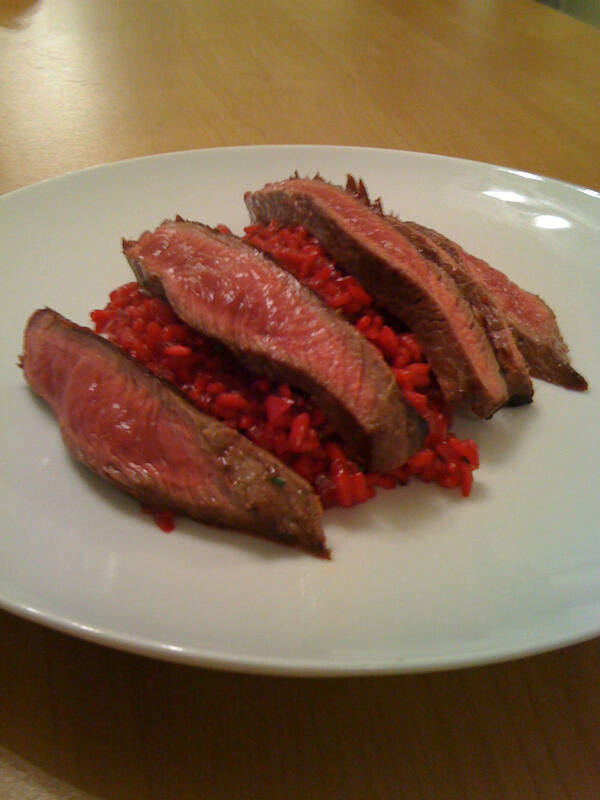 The rump steak is an optional extra but the rare beef works brilliantly well with the deep, savoury hit of beetroot. A final addition of mild, garlicky chives complements the earthiness of risotto. Heat the beetroot juice in a saucepan and reduce the quantity by half over a high heat. At the same time, make sure the water is hot. Gently fry the onion and chilli in some oil for five minutes, until it’s translucent. Add in the rice and coat well in the onion mix. Pour in the white wine and let it reduce till it has evaporated. Add in the first ladle of water and stir constantly. Continue the process for 10 minutes, only adding more water in once the previous ladle has been absorbed. Heat a frying pan and rub oil onto the steaks and season well with salt. Add to the smoking hot pan and cook for 2 minutes on each side, adding the thyme, garlic and butter after the steak has been turned. Take out of the pan, sprinkle immediately with a little salt and leave to rest on a plate, pouring over the buttery juices to baste. Now, add the beetroot juice to the risotto and cook for five minutes. Take off the heat and season with salt, pepper and chives. 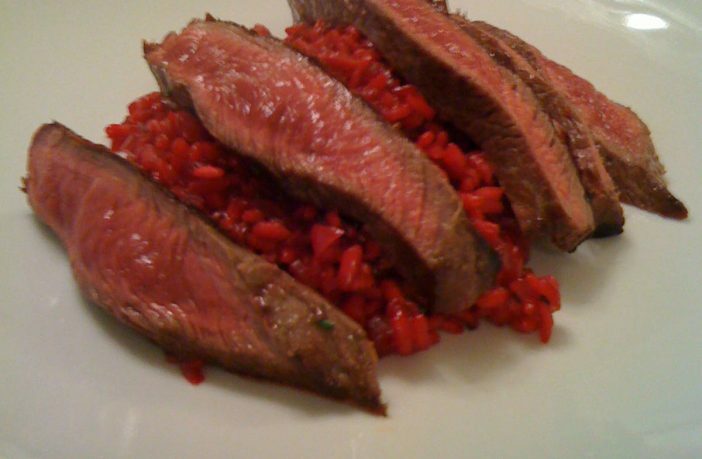 Leave the risotto to sit, almost like resting a steak, off the heat for three minutes. Add in a knob of butter and stir through. I first read about this technique in a Heston Blumenthal book and it really does make a difference; the butter adds a creaminess to the dish that really helps contrast the sharp beetroot. Finally, carve the meat and assemble the dish.